Addressing the intractable challenges that prevent young people from meeting their highest potential means more than just creating pathways for them to succeed. Successful youth engagement means bringing youth voices into the forefront, but how does that look, and what communities are doing it well? Our report, Including All Voices: Achieving Opportunity Youth Collaboration Success Through Youth and Adult Engagement, looks at local collaborative approaches to youth engagement that recognize youth and young adults as agents in their own growth and development and enlists them as partners in designing solutions to issues that impact them. 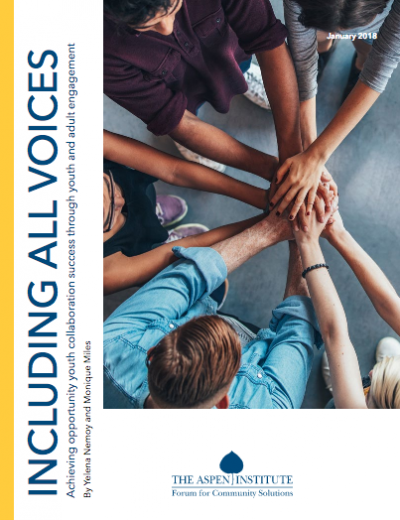 The publication also highlights promising strategies in youth engagement and youth-led change and suggestions on how to expand these efforts so that youth are continually driving local and national policies. "The concept of youth and young adult engagement is central to the youth development field and involves young people as active agents in their own growth and development, rather than passive recipients of programs or services provided by others. Increasingly, youth-serving programs and systems are recognizing that they cannot effectively develop and implement programming without youth engagement in the work." The Forum for Community Solutions’ Opportunity Youth Forum works with cross-sector, cross-system collaborative initiatives across the U.S. that are focused on building and deepening the education and employment opportunities for opportunity youth, who are 16- to 24-year-olds who are out of work and school. Youth- and Young Adult-Led Change: Youth and young adults lead advocacy and programming.